How To Tell Google To Re-Index Old Updated Contents? Home > SEO > How To Tell Google To Re-Index Old Updated Contents? Technology and the other things in the world are changing every day, I think every second. If you are a blogger and content publisher then you must know how much it is important to keep update all blog posts and let search engines to re-index old updated contents. Actually no one likes to read or learn old tutorials. And Google and other major search engines are strongly tell to all content publishers to keep their blog posts up to date. For example, "Windows XP was a most popular operating system in 2010. But now it replaced with windows 10. If you wrote some tutorials about Windows XP in 2010 and still they are live in your blog then it’s the time to update those posts to Windows 10 tutorials. Otherwise search engines will mark those posts as low quality content and no added value list." LEARN: How To Find And Fix Low Quality Content? 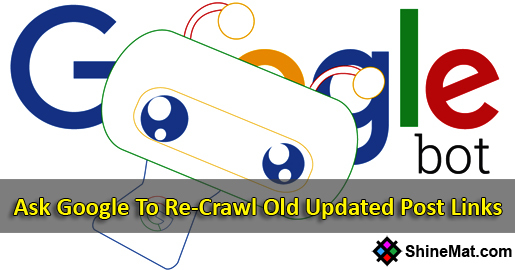 After fixing and update your old blog posts it’s time to let know Google search engine that you have completely updated your outdated blog contents. In this post I will teach you how to tell Google to ReCrawl old blog posts again to index your updated posts. How to request Google To Re-Index old updated contents? Actually it is pretty easy to inform Google search spider to index old updated contents. To do this process you will need Google Search Console Tools. First log in to Google Search Console. Go to Crawl and select Fetch as Google. Now paste your post URL in the box. Click FETCH AND RENDER button. Note: Do not enter your full post link in the box. 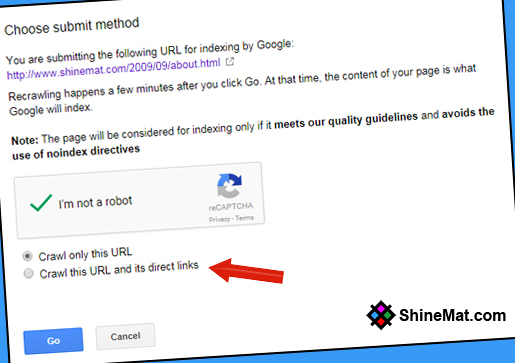 You will see your homepage URL already exists just next to the box. So, simply enter the rest URL after your homepage URL. Finally after showing your submission status green, select Request Indexing. Now complete the reCAPTCHA and select how Google bot will crawl your blog post. Now, wait for few hours to get indexed your updated contents in Google SERP. Note that, your updated posts must follow the content quality guidelines. Hope this post helps to re index old updated contents second time. Thanks for being with me. Don't forget to leave comments and share with your friends. Stay well and Stay good. Allah Hafez.